Our Syracuse construction accident lawyers often get the same questions from construction workers who have fallen from heights or who have had objects fall on them at construction sites or who are otherwise injured on the job site. Here are the most common questions and our answers. What Causes Workers and Objects to Fall at Construction Sites? Without a doubt, unsafe working practices and safety rule violations cause almost all construction site fall injuries. According to the Occupational Health Safety Administration (OSHA), workers falling and objects falling on them are some of the most common accidents resulting in severe injuries to workers at construction sites. A third of construction site fatalities are caused by worker falls alone. What Laws and Regulations Help New York Construction Site Fall Victims and Victims of Falling Objects in Court? Our construction accident attorneys handle cases in Syracuse, Auburn, Geneva or Liverpool and all over New York State, including downstate and the New York City area. It doesn’t really matter where the construction accident happened because everywhere in New York our State construction laws gives special protection – far more than any other State – to fallen construction workers and workers who have been struck by falling debris or objects. Although OSHA offers some general protection, the equivalent of OSHA in New York, called the New York Industrial Code, offers much more protection. That code sets forth important safety rules which, if not followed by the employer or owner of the construction site, can be the grounds of a New York injury lawsuit. In addition, New York has several important construction safety statutes, including Labor Law sections 200, 240 and 241(6), that are often grounds for a claim. Labor Law section 240 offers the most protection for worker falls or fallen object victims. What if My Fall from the Ladder, Scaffold, Roof or Structure Was My Own Fault? In New York, even if the construction fall was largely the worker’s fault, or the fault of his employer or co-worker, New York’s Labor Law section 240, one of the most powerful construction safety laws in the nation, usually allows the injured worker to bring a “third-party action” against the owner of the site and/or the general contractor or others. Does Workers’ Compensation Bar My Case? Although New York’s workers’ compensation law bars an action directly against the employer, it allows “third-party actions” against other sub-contractors, the general contractor, and the owner of the site. 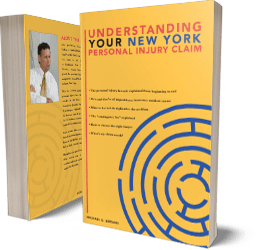 Therefore New York’s workers’ compensation law rarely bars the claims of a fallen worker, or the worker who was struck by a fallen object. What Kinds of Things Fall on Workers? Tools, platforms, debris and raw materials can and do fall when accidentally dropped or not properly secured or when other structures collapse. All these falling objects threaten those who are on the ground below. Even the simple task of installing a window panel or ceiling light can lead to a falling object and cause injury if not properly raised or secured. Sometimes the hoisting device fails to retain the object, or the object comes loose from the wall or other structure. Why do These Things Keep Falling on Workers? Construction projects require that lots of materials be hoisted up above and the workers must also work from heights where they carry large sets of tools that they can accidentally drop. Tools such as hammers, wrenches or screwdrivers sometimes inadvertently fall out of workers’ hands or from scaffolds where they are not properly secured. Wooden planks or panels or other parts of scaffolds fall when the scaffolding is not properly constructed. How can Falling Debris Accidents be Prevented? Marking the work area with warning signs as to the danger of falling debris. Erecting barricades where debris is likely to fall. Inspecting equipment and scaffolds to ensure there are no loose pieces and that they are secure. Following all rules regarding securing and putting away tools. Installing netting to catch falling objects before they are able to strike workers below. Construction accident attorneys like us in the Syracuse area and throughout the State help prevent these accidents by bringing claims against the responsible parties. These claims make those companies try to eliminate such accidents by following proper safety rules. Besides Preventing Falls and Falling Objects, What Duties do Construction Companies Have Toward Workers? It is the obligation of all construction site contractors to provide a safe work space and environment not only for their own workers, but for others on the site. This rule is most clearly set forth in New York Labor law section 200. Under that law, a construction company or construction site owner can be held liable not only when a worker or an object falls, but for all kinds of injuries that happen on the site. If a court determines that the construction site was unsafe or unreasonably dangerous or that the contractor could have and should have prevented the injury, then the construction contractor or owner may be held liable. There are many reasons a construction site can be deemed unsafe: debris scattered in passage ways, slippery surfaces, falling objects, dangerous and poorly maintained machinery and equipment, etc. What Should I do if I or a Loved One is Injured on a Construction Site? If you or a loved one was injured or killed in a fall, or from falling debris on a construction site, or from any other danger on the site, obviously you should get medical attention first. But when you have the opportunity, you should contact one of our Syracuse construction accident attorneys to learn more about your legal rights. We have successfully recovered compensation for many others with cases similar to yours. We have filed hundreds of lawsuit for negligence and wrongful death in Courts in the Syracuse area as well as in other courthouses throughout the State. By bringing a claim for your construction accident injury, you are not only helping yourself and your family to recover important financial compensation, but you are also sending a message to the construction industry that cutting safety corners does not pay off. You will get compensated for medical expenses, lost income and pain and suffering, and if the fall or injury resulted in death, the victim’s family will get compensated for the loss of economic support. None of our Syracuse construction accident lawyers require upfront payment and you will be charged a 1/3 fee out of whatever compensation they can get for you. If they attorney are unable to settle your case or win a judgment for you, there is no fee.